Great place to stay, helpful staff, great facilities, amenities and atmosphere. Will come back! I had a great time! The staff were lovely and very helpful. The atmosphere was great during parties and everyone was quiet in our room. I liked this place, it's a short distance from Hakata Eki, and has free breakfast and good wifi. Staff is friendly and helpful, there's a nice lounge and fridge. Bed and bathrooms were clean. It's a good spot, you can't go wrong with this place. Very seamless check in and check out. The staff were very friendly and helpful, not to mention the beds were comfortable! I really enjoyed my stay there even if it was only two nights! Great place with bicycle to rent, the ones I got weren't in the best condition but did the job. I got there on Christmas Eve and the staff held a great party for everyone with takoyaki making station, free snacks and booze, we had a great time together! Thank you! Super clean, super friendly hostel, lots of nice touches. 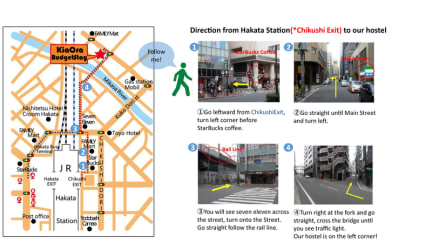 A short walk from Hakata station, from there you can take a bus or train to wherever you need to go. The only down side is that the building is right under the freeway, so earplugs are a must. But I will definitely try to stay here again next time I'm in Fukuoka. My stay at Kia Ora was pretty good. The bed was comfortable and the location made the city center very accessible, as well as other parts of the city. The atmosphere is a bit stifled, and I can't really tell why, so that's some points off. Otherwise a pleasant stay and totally worth the money. This was a good hostel. It lacked the general hostel atmosphere though. It was hard to make friends there, as most of the guests were Japanese and stuck to themselves. The staff was very friendly and helpful. 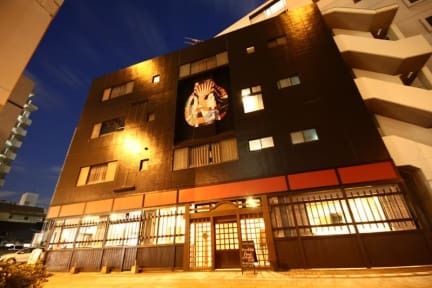 The hostel is about a ten minute walk from the main station in Fukuoka, which is a bit out of the way. It's a drag if you don't quite know where you're going and are carrying lots of luggage. No curtains on the beds. Standard hostel breakfast.